Q: When were you born and what was your childhood like? I was born to Hans and Margarethe Luther (Ziegler) on November 10, 1483, in Eisleben in the Holy Roman Empire – in what is now eastern Germany. I was baptized the next morning on the feast day of St. Martin of Tours. My family moved to Mansfeld in 1484, where my father operated copper mines. He was determined to see me, as the eldest son, become a lawyer. He sent me to schools in Mansfeld and in 1497, Magdeburg, where I attended a school operated by a lay group called the Brethren of the Common Life. In 1498, I attended school in Eisenach. 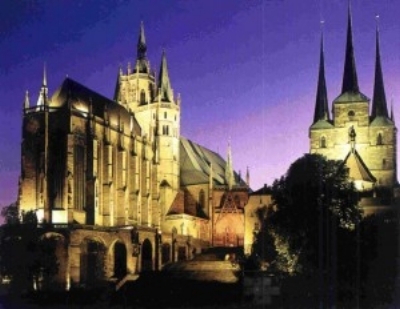 At the age of seventeen in 1501 I entered the University of Erfurt. I received my Bachelor’s degree after just one year in 1502. Three years later, in 1505, I received a Master’s degree. In compliance with my father’s wishes, I enrolled in the law school of that university. The course of my life changed during a thunderstorm in the summer of 1505. A lightning bolt struck near me as I was returning to school. Terrified, I cried out, “Help! Saint Anna, I will become a monk!” I soon left law school, sold my books, and entered the Augustinian monastery in Erfurt on July 17, 1505. My father was not pleased with this decision.